Next up today, the 2014 Coffee Spot Award shortlist for “Best Physical Space”, which was won last year by Cardiff‘s The Plan. One of the most important things for me is how a Coffee Spot looks and feels. This, to me, is just as important as the coffee. Practically the definition of a Fernandez & Wells branch is a sense of understated elegance. I could have just as easily nominated Somerset House, but decided to go with Exhibition Road and, in particular, the second room where I love to sit by the window. It’s not all about sumptuous elegance, although there’s a lot of that on offer in this year’s shortlist. However, Devon Coffee epitomises the homely, welcoming end of the scale, with its all wood interior. There are wooden floorboards, wooden planks on one wall, wooden panelling on the other, plus wooden benches, tables and chairs (I spotted one metal chair, which felt somewhat out of place). The ceiling (which is very high, adding to the sense of space) is whitewashed, as is the back wall. 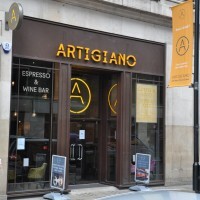 As is the case with Fernandez & Wells, so it is with Artigiano Espresso, which has some beautifully-appointed coffee shops. My favourite in terms of layout and just shear beauty, is the New Oxford Street branch, which is now sadly closed. I could just as easily nominated either of the other two branches, the original opposite St Paul’s Cathedral or the new branch in Exeter. 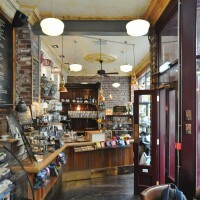 The Boston Tea Party specialises in taking iconic buildings and turning them into wonderful coffee shops. With the Birmingham branch, it has surpassed itself. with its most handsome branch so far. It’s also got the largest single-floor area of all the branches I’ve visited.It also pulls off the usual Tea Party trick of simultaneously being a Boston Tea Party and yet being very much its own place. The Boston Tea Party has also been nominated in the Best Breakfast Award. Bewley’s Café on Grafton Street, which first opened its doors in 1927, is one of those names that is associated with the great cafés of the past. With its gorgeous façade, sumptuous interior, lovely artwork and full table service, it’s definitely an experience. What made Coffee Barker, the parent of Cardiff‘s Barker Tea House, stand out from the crowd was its lovely interior. However, if you thought that Coffee Barker had a lovely interior, then wait until you see the Tea House! It has the same wonderful features that made me fall in love with Coffee Barker (person-swallowing sofas, uber-comfortable comfy chairs, quirky, retro décor) but takes it to a whole new level with a stunning first floor seating area. Stumptown’s second NYC location on West 8th Street possesses quite possibly the most handsome interior of any coffee shop I’ve ever seen. It consists of two connected spaces: a lavishly fitted-out espresso bar and a smaller, more intimate brew bar, with its own door onto MacDougal Street. The original Bettys is a grand, sprawling structure spreads over three levels. There are three parts to Bettys: a takeaway cake counter, a café-bar & through the café, the most opulent of all, a full-service tea room. 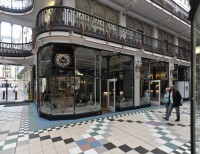 Faculty is located in Birmingham’s beautiful Piccadilly Arcade. The central corridor, lined on either side by glass-fronted shops, runs through the old auditorium, the slope from New Street to Stephenson Street and it makes a beautiful setting for Faculty, which takes its elegance from its setting. 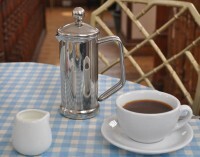 Faculty has also been nominated for the Best Coffee Spot Near a Railway Station Award. What can I say? 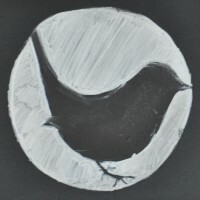 I rather like the Wren, set in the soaring interior of a Christopher Wren church in the heart of the City of London. It might just be the most glorious setting for a coffee shop, with an immense sense of space. The Wren has also been shortlisted for every award under the sun this year (for the record: Best Cake, Best Outdoor Seating and Happiest Staff). The Tea House Theatre doesn’t serve coffee. However, if you accept this flaw, you are rewarded with a fabulous interior, rather like an overgrown lounge. In summer, with the sun streaming in through the windows, it’s a bright, airy space, while in winter, it’s warm, cosy and welcoming. 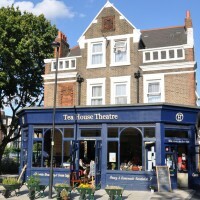 The Tea House Theatre has also been shortlisted for this year’s Best Cake Award. Continuing a theme of Coffee Spots in Victorian shopping arcades, Manchester’s Pot Kettle Black graces the Barton Arcade, one of the most beautiful I’ve seen. Pot Kettle Black takes its lead from there, with gorgeous external features and some ornate and sumptuous window art. Inside, it’s one of the most beautifully-appointed coffee shops I’ve visited. 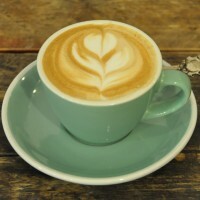 As I have said, this Award is one for which there could have been multiple possible shortlists, so a special mention is due to a number of places starting with the two other Artigiano Espressos, the ones in Exeter and opposite St Paul’s Cathedral. The other Fernandez & Wells in Somerset House also deserves a mention, as do two roaster/cafes in glorious spaces, London’s Caravan King’s Cross and Steampunk’s The Warehouse in North Berwick. Finally there York’s Perky Peacock, Lendal, Leeds‘ Mrs Atha’s and the Villiers Coffee Co in London, all of whom could easily have graced the shortlist.